Must get the human cooties off of me! Early on during this past weekend, it really looked like we might lose our Tigger. She has had issues with going off her food throughout her life. She has been in to the vet at least once a year all of her ten years. There has never been a clearly defined reason or cause found. What makes it really hard is how quickly it hits. She will be eating everything in sight, running around and playing with no signs of feeling ill at all. Then she will go in for the night or lay down for an afternoon nap and it is like a switch has been thrown. The next morning or after her nap, Tigger doesn’t want to eat, drink or move. It has seemed like a gassy tummy issue on many occasions. Per the vets instructions, we would give her Simethecone, extra water, tummy rubs, get her to move around and switch to hay only. The problem would usually clear up in a few hours or overnight and she would be back to normal. We have watched for any common denominator in foods or activities, but there seems to be no identifiable pattern. This past year, the problem has been more severe and she gets quite ill and takes days or weeks to return to normal. She has seen the vet a lot. She has been checked out head to toe, had tests, and been put under anesthesia twice for tooth exams and had a couple filed down to be sure they weren’t the cause. The anesthesia makes me so nervous since that is riskier at her age. This weekend she took her afternoon nap and when it came time to wake up and run around again, she seemed completely unresponsive to everything around her. Poor Shadow was licking her from head to tail without any reaction on her part. Then he pawed at her trying to get her to respond to him. She opened her eyes wider, but that was it. We separated them and went to work giving the pain meds and Simethecone in the vet prescribed doses and then syringe feedings of water and Oxbow Critical Care. In between we would offer Tigger parsley, a favorite, and a variety of hays. She seems to eat when we offer things to her and hand feed her. We have also been giving her tummy rubs. Late yesterday, she started to show some temper over being medicated, fed and cleaned up. Our Tigger is coming back again, at least for now. We are winning battles to keep her with us, but realize that at ten years old, losing the war is closer than we would like it to be. Any time a rabbit absolutely refuses to eat or drink, get serious about it right away. 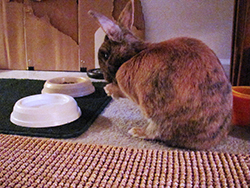 Rabbits are constant foraging eaters and need that to keep their intestines moving. Anything that stops movement through the intestines can quickly lead to the death of the rabbit. This is one of those times to get thee to a vet ASAP since the causes of GI stasis can vary. You might be dealing with a tumor, infection, hairball, tooth problems or something else entirely. Expect if you are dealing with stasis that there will be a time of nursing your rabbit. This can include medications, force feedings, forcing fluids, getting subcutaneous fluids at the vet or possibly being shown how to give them at home. You will have to monitor how much your rabbit eats on its own and how much bunny is urinating and pooping. This can mean adjusting the rabbit’s living space or possibly separating a pair temporarily so that you can know who is doing what. At first while your rabbit is really ill, they may not be themselves at all. It may be a real struggle to get the bunny to cooperate with being medicated, force-fed, having their tummy rubbed, being cleaned up, so basically being regularly picked up and messed with. You know how you feel about people poking and prodding if you don’t feel well. The bunny may be listless, uncaring, grumpy, irritable, scratching, biting, wildly fighting or any combination back and forth. Keep your calm and your patience. As your rabbit recovers, their usual personality will return. They just may seem like they really hate you while you are trying to save them. Again, think about whether you have ever chewed out the doctors or nurses when you were ill.
Tigger is currently on a number of medications and holding her own. She is eating and drinking on her own now and alternating between very tiny or very messy poops. She is very grumpy and irritable today which is pretty normal for HRH Princess Tigger. She has another vet visit early next week. We will see if she needs further diagnostic tests or treatment. Last August, she needed to have some sharp tooth points filed down. That required anethesia for a good exam and to do the filing. Anesthesia is risky at her age. So, in conjunction with the vet then and now, we decided on other treatments first. Here is a great article to bookmark: Nursing Your Rabbit Through Gastrointestinal Stasis (Information And Tips To Be Used In Conjunction With Ongoing Care From Your Rabbit Vet). This has been a rough week. Tigger sometimes has tummy issues where she is a little off and gassy. However, last Sunday, she went more than a little bit off and towards serious stasis. A vet visit brought us home with lots of meds, a four page set of instructions and a lot of dread. We have been through this before with her last August and almost lost her. It has been a stressful and tiring week, fighting for a bunny and with a bunny to get meds and food and water into her, then watching for bunny poops. We have kept her moving and thankfully at this point have her eating again, running around and have some poops coming back. 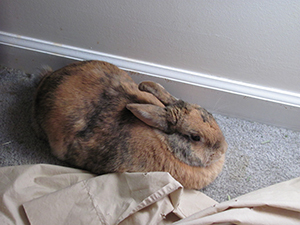 Later today, I will have more on nursing a bunny through stasis.